Whether you’re newly certified, you love longer dive times, more natural light for photography or it’s just been a while, our late morning charter is the dive trip for you! All dives are led by either a Divemaster or Instructor, and will be in small groups to ensure the safety and enjoyment of all our divers. Explore the reef during this 4 hour tour with snacks and beverages! Meet your professional guide at the boat in Kewalo Basin, parking is available right by the boat. The boat leaves when you are all ready to go, no need to rush to maintain a schedule. Time to have fun! Visit two shallow reefs, average depth of 40’(12m), where you will find tons of reef fish (25% of which are endemic to Hawaii), eels, octopus, turtles, rays and even sharks! If you are not certified, you can join the Discover Scuba Diving program, go back and select the introductory dive. When you are ready to go, you can tailor each trip to what you want to see and do. Every dive site is known for different animals, try to find your favorites.The guides will help set up the equipment and maintain a safe, fun environment. Your safety is our priority, so maintaining a perfect safety record while having the most fun is the goal! 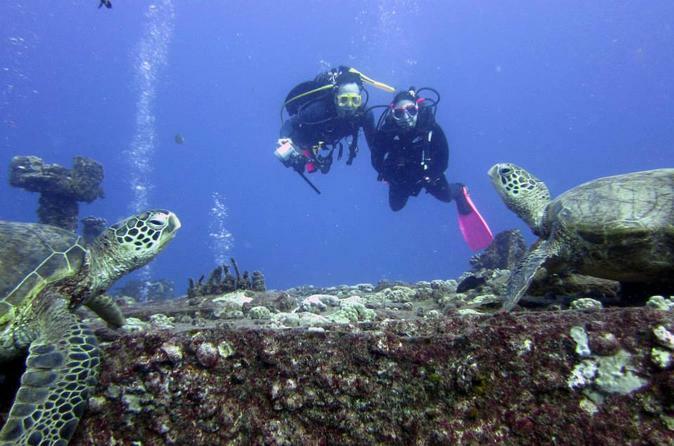 After two great dives, you will return back to the slip just in time for an evening activity.